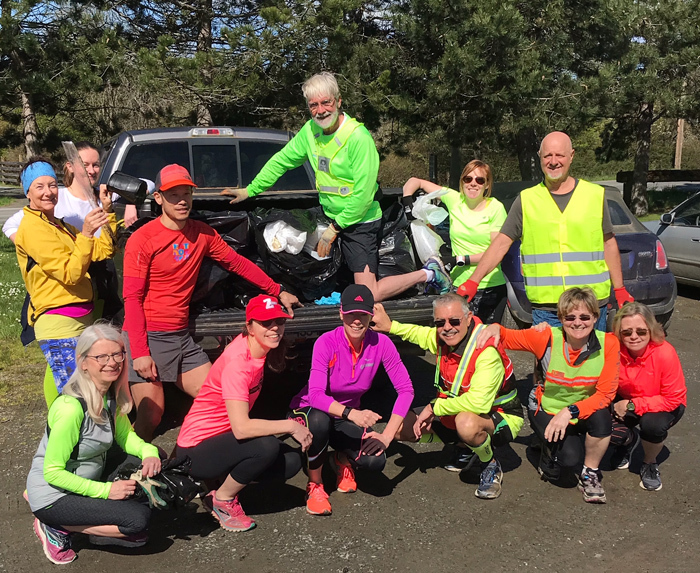 Salt Spring Sneakers members after they picked up trash from a huge swath of Upper Ganges Road in last year's inaugural Greening Salt Spring campaign. The last of Salt Spring’s brutal winter’s snow has finally disappeared from the roadsides and ditches, revealing all the trash that has accumulated over the winter months. We’re hoping islanders will once again join the Driftwood and our Streets of Salt Spring columnist DW Salty in heading out on island roads, streets, pathways and beaches to rid them of garbage and recyclables. Last year’s inaugural Greening Salt Spring campaign had such a big impact that the Driftwood is spearheading the effort again in 2019. We invite individuals, families and groups to commit to cleaning up a section of the island between now and Earth Day, which is April 22. We’d love to be able to acknowledge everyone who does their part, no matter how small, so ask that you send an email to the Driftwood’s “green queen” Elizabeth Nolan at enolan@gulfislandsdriftwood.com with your name and what area of the island you plan to clean up. You can also call her at 250-537-9933, respond to our Facebook post asking for volunteers or drop in to the office at 328 Lower Ganges Rd. to share your info in person. New this year for people signing up is free garbage disposal provided by Laurie’s Recycling and Waste Services. People committing to clean up a particular section of road or street will be given a Driftwood-created tag to identify themselves as a Greening Salt Spring participant when they drop off the garbage they have collected. Thank you to Nancy and Laurie Hedger for offering this service. It was their idea! We are also hoping to give clean-up participants the option to donate funds from the recyclables they pick up to a green island charity. More details will be provided once we have them. As well, stay tuned for more info about an Earth Day Ganges clean-up blitz organized by the Chamber of Commerce. Having spent a few hours cleaning part of my neighbourhood road last year, I have a couple of tips to share. For managing the multitudinous small items — like candy bar and soya sauce wrappers and cigarette butts — it’s useful to carry a small bag to pop them into. Larger garbage bags can carry the recyclables. You don’t want to mix the true trash and the recycling in one bag. Yuck! Bigger stuff like car parts might best be dealt with separately so your bag doesn’t get too heavy and break. Footwear is also a consideration. Even if it’s sunny when I head out this year I will be wearing my gumboots. Last year my hiking shoes got wet and grossly muddy when I had no choice but to hit the ditches to reach some of the trash. This goes without saying, I’m sure, but don’t forget your gloves!